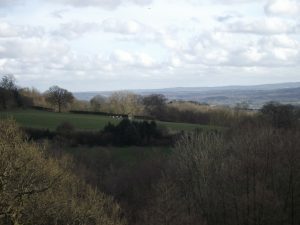 Ide Hill is within the Green Belt. This information below relates to protecting Green Belt land. 79. The government attaches great importance to Green Belts. The fundamental aim of Green Belt policy is to prevent urban sprawl by keeping land permanently open; the essential characteristics of Green Belts are their openness and their permanence. 81. Once Green Belts have been defined, local planning authorities should plan positively to enhance the beneficial use of the Green Belt, such as looking for opportunities to provide access; to provide opportunities for outdoor sport and recreation; to retain and enhance landscapes, visual amenity and biodiversity; or to improve damaged and derelict land. 83. Local planning authorities with Green Belts in their area should establish Green Belt boundaries in their Local Plans which set the framework for Green Belt and settlement policy. Once established, Green Belt boundaries should only be altered in exceptional circumstances, through the preparation or review of the Local Plan. At that time, authorities should consider the Green Belt boundaries having regard to their intended permanence in the long term, so that they should be capable of enduring beyond the plan period. 84. When drawing up or reviewing Green Belt boundaries local planning authorities should take account of the need to promote sustainable patterns of development. They should consider the consequences for sustainable development of channelling development towards urban areas inside the Green Belt boundary, towards towns and villages inset within the Green Belt or towards locations beyond the outer Green Belt boundary. 86. If it is necessary to prevent development in a village primarily because of the important contribution which the open character of the village makes to the openness of the Green Belt, the village should be included in the Green Belt. If, however, the character of the village needs to be protected for other reasons, other means should be used, such as conservation area or normal development management policies, and the village should be excluded from the Green Belt. 87. As with previous Green Belt policy, inappropriate development is, by definition, harmful to the Green Belt and should not be approved except in very special circumstances. 88. When considering any planning application, local planning authorities should ensure that substantial weight is given to any harm to the Green Belt. ‘Very special circumstances’ will not exist unless the potential harm to the Green Belt by reason of inappropriateness, and any other harm, is clearly outweighed by other considerations. 91. When located in the Green Belt, elements of many renewable energy projects will comprise inappropriate development. In such cases developers will need to demonstrate very special circumstances if projects are to proceed. Such very special circumstances may include the wider environmental benefits associated with increased production of energy from renewable sources. 92. Community Forests offer valuable opportunities for improving the environment around towns, by upgrading the landscape and providing for recreation and wildlife. An approved Community Forest plan may be a material consideration in preparing development plans and in deciding planning applications. Any development proposals within Community Forests in the Green Belt should be subject to the normal policies controlling development in Green Belts.